At North Footscray the scoreboard attendant is also the timekeeper, but doesn’t exactly watch the game from the best vantage point. 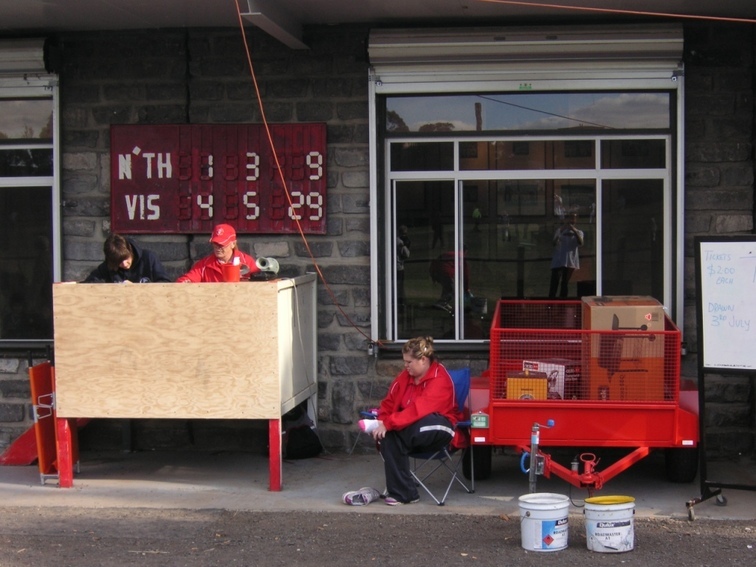 The scoreboard and desk is tucked away in a forward pocket, ten metres back from the action, up against a bluestone wall. Still, it’s sheltered and there’s room to back in the big prize for the raffle – a red trailer. North Footscray are the Red Devils and wear a lovely simple jumper of vertical red and white stripes. The club was formed in 1934 and has long been part of the Western Region Football League (and its forebears), in the industrial heart of Melbourne’s western suburbs. The northern end of the home ground backs onto factories. The Devils won the second division premiership in 2010. ‘Not sure who won the raffle.